I’ll be taking a break from the Photography Workshops during the summer of 2019 – resuming again in the Autumn. Meanwhile – one-to-one sessions will continue as normal. This Evening Photography Walk is based in Ludlow, Shropshire. A relaxed and instructive photography walk around the lovely old town of Ludlow. With the opportunity to gather wonderful pictures while enjoying expert photographic guidance and tuition with Philip Dunn. What a wonderful time of day to take pictures! This Photography Workshops is based in the attractive and historic town of Shrewsbury. Prepare yourself and your camera. Use light to add visual impact and atmosphere. Anticipate your subject’s next move. When to ask a subject’s permission. The best lenses for the job. Frame your image for max effect. If you would like to buy a very special present for someone you care for, I can email you a simple Gift Voucher on receipt of payment. This can be printed out and pasted into your own personal card. The voucher will be valid for one year, after which it can still be used, but is subject to any price increases. Working for Britain’s top newspapers and magazines, professional photographer Philip Dunn has travelled the world for over 40 years. 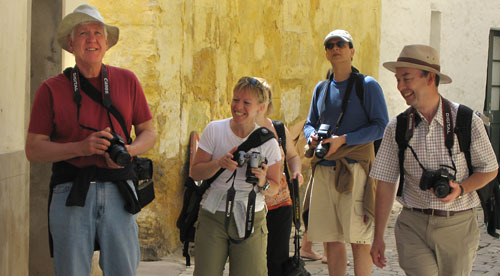 Now you can benefit from his unique photographic experience, and learn how to capture the magic of every place you visit. Join Philip Dunn for a Street Photography Workshop – right there where it matters – in the street.